Have you downloaded the JMRS app yet? Get access to early view and share articles via email – available on IOS and android. Head to the App store to download for free Apple App Store! 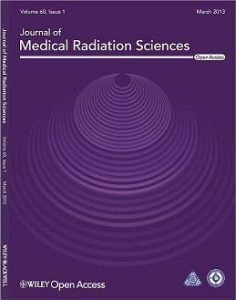 JMRS is the joint journal of both the New Zealand Institute of Medical Radiation Technology (NZIMRT) and the Australian Society of Medical Imaging and Radiation Therapy (ASMIRT) and was launched in 2013. The journal is an international and multi-disciplinary, peer-reviewed journal that accepts manuscripts related to medical imaging/diagnostic radiography, radiation therapy, nuclear medicine, medical ultrasound/sonography, and the complementary disciplines of medical physics, radiology, radiation oncology, nursing, psychology, and sociology. JMRS is published by Wiley-Blackwell and is fully open-access and is available online here. Four issues are published annually in March, June, September and December. Examples of papers that JMRS publishes are original articles, commentary articles, case studies, articles on professional education and book reviews.The NZIMRT and ASMIRT invite authors to submit their manuscript to JMRS.